The New Year is a time for all of us to reflect on our lives, contemplate our achievements and failures, look into the future and pledge resolutions for making us better people, and to LOSE WEIGHT! Just kidding! ( but not really…) On New Year’s Day the whole nation realizes that eating Halloween candy, stuffing, English toffee and buttered rums nonstop for three month’s causes some unflattering bulges and a serious case of lowered self-esteem due to ill-fitting pants. I personally did a decent job this Fall up until December 10th. Then, I just went crazy and ate star-shaped sugar cookies for breakfast. It was like Hansel and Gretel in my apartment for three weeks. But now the fairy tale is over, I’m 5 pounds heavier, and it’s time to shift back into a more veggie-centric eating plan. At least, that’s what I thought as I lifelessly began chopping carrots. But, surprisingly enough, it wasn’t boring and turned out to be quite tasty and filling. Plus it is worth 1 Weight Watcher’s point a cup. 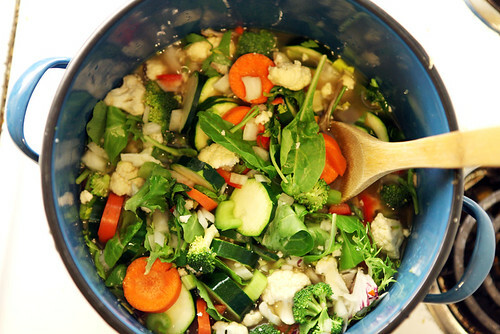 To make a tasty soup, all you need to do is throw a mix of your favorite vegetables into a soup pot. 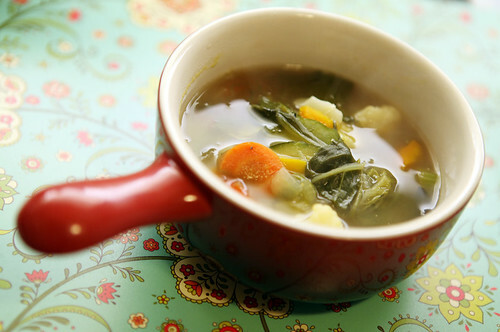 I used broccoli, celery, spinach, carrots, zucchini, onion, garlic, red pepper and cauliflower. Pour in enough chicken stock so that the vegetables are covered and then bring it to a boil. Once it boils, turn the heat to low and let it simmer for 10-15 minutes. Season with thyme, lemon juice, pepper and (lots of) sea salt. You can also add in some noodles or rice if you need your carb fix. 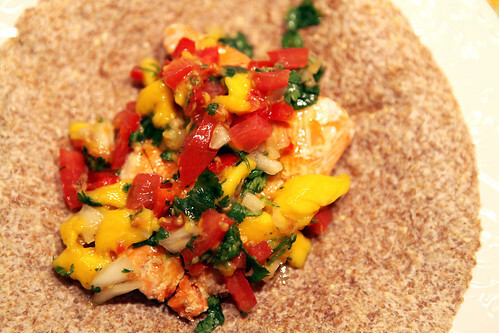 What is YOUR favorite low-calorie dinner? I’m taking suggestions for upcoming posts. In addition to the vegetables, I’m starting up Pilates again, which I’m really happy about! I’m so sore I can barely manage to do basic functions. No matter how much walking or running you do, nothing will leave you more sore than a Pilates class. Now I’ll leave you with this hilarious, and kind of inappropriate, “morning warm-up” workout video. I had visions of myself making a video of me attempting this, but then I realized I would live a life of shame from then on… so I decided against it. 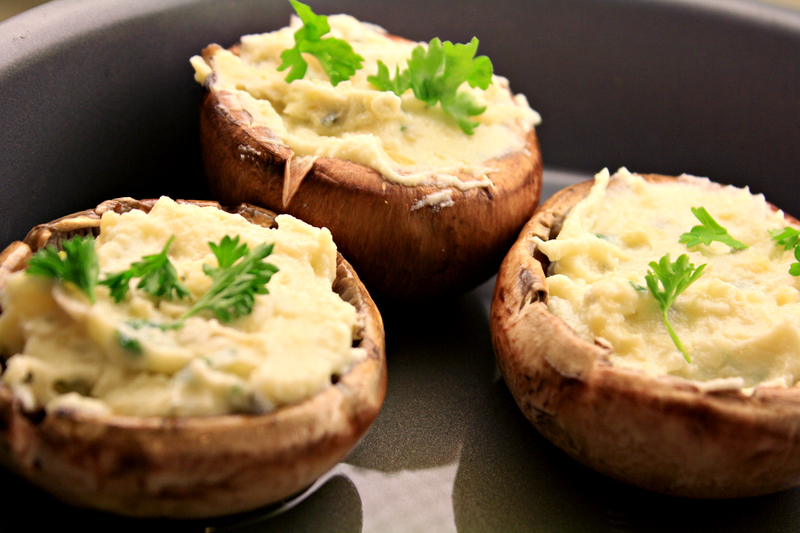 Stuffed mushrooms are SO tasty and versatile, not to mention easy and fast to make. Since bread is off-limits for the first two weeks on the South Beach Diet as well, they work as a nice substitution for bread in pizzas and as an accompaniment to cheese. Soft or full-fat cheeses are not allowed on the SBD until later or in moderation, so if you are really strict about no cheating whatsoever, you can substitute it with a reduced fat cheese. Dhiren brought home these two cheeses though and they worked out nicely and added lots of flavor. I don’t think 2 tbsp of cheese is going to set me back or rekindle any cravings. 1. Preheat the oven to 350°. 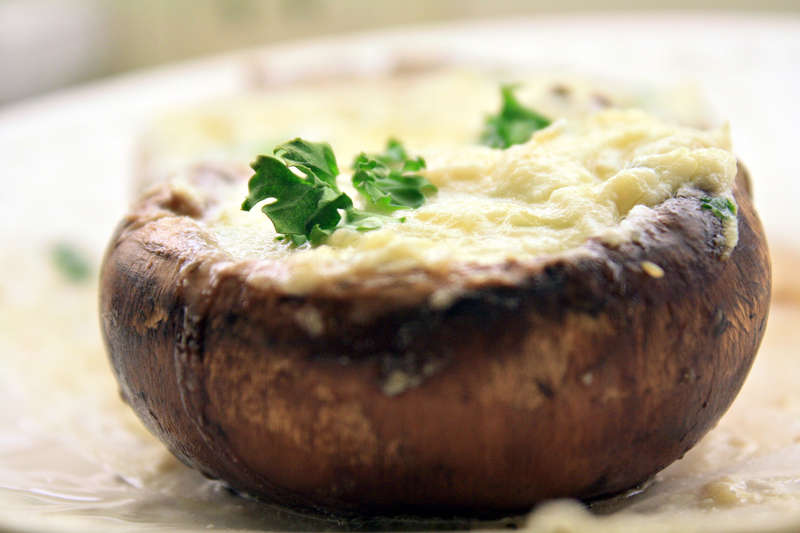 Clean mushrooms and remove the “gills” on the inside with a spoon. Heat a skillet and then cook mushrooms for 4-6 minutes on medium heat. This reduces the time needed in the oven. 2. After 3-4 minutes, toss in the minced shallots, garlic and parsley and sauté in a tsp of olive oil. Scrape into a bowl, add the cheeses and incorporate together with a fork. 3. Place mushrooms in a baking dish with the rest of the olive oil (I just used a cake pan– whatevs!) and fill them with the cheese mixture. Salt & pepper them, and then place in the oven to cook for 5-8 minutes or until the mushrooms are soft and the cheeses bubbly. Next time I try this, I’m going to try broiling it, so the cheese gets that nice browned look on top. I’m not a serious meat person, but the thought of a lamb chop always makes me excited. We never had lamb for dinner in either of the homes I grew up in. Instead, I was raised on chicken, beef and turkey with the occasional veal cutlet and fish thrown in. Trying lamb for the first time was a taste-bud meltdown. (The same is true for duck!) 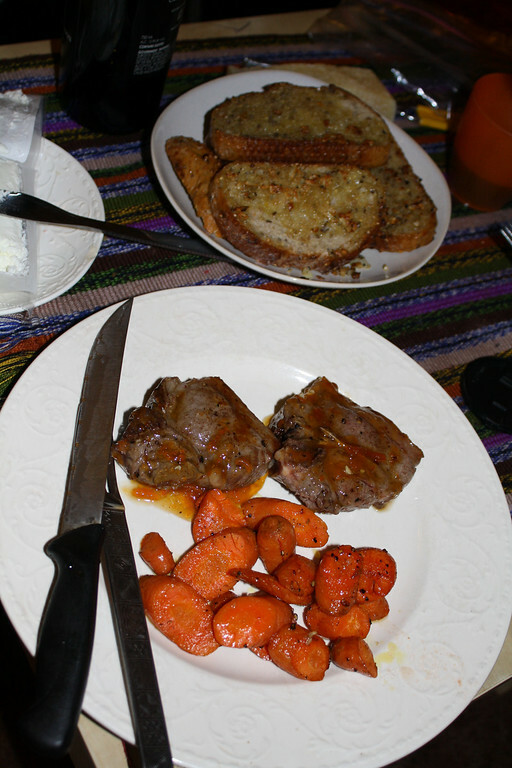 The thing I love the most about lamb is its simplicity and fat content. Lamb is so flavorful on it’s own, that there’s not much more you need to do to it. Here are three pretty simple recipes for lamb: Simple Lamb Sliders, Oliveri Lamb Stew and Lamb Chops with Apricot Compote. MMM. Enjoy! 1. Form the lamb into small 1/4 inch balls and smash together while you heat up a portable grill (godbless my George Foreman) or use a real one if you have it. 2. Heat up olive oil (1-2 tbsp) in a small frying pan. Chop some onion into long slivers. Once the oil is ready, throw in the onions and caramelize. 3. Grill the lamb to your liking. 3. Toast the English muffin. Once done, top with a thin layer of apricot jam or chutney. 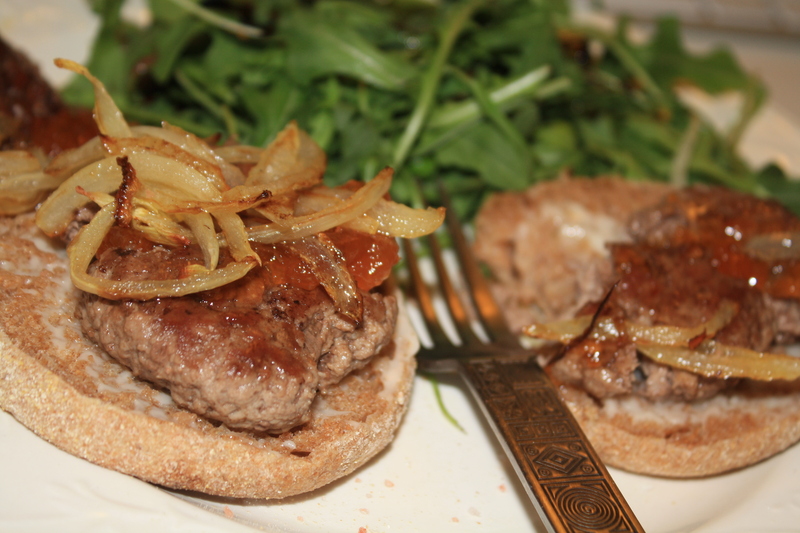 Fix the lamb on top and then put some caramelized onions on it. Delish. Serve it alongside fresh arugula with balsamic oil and you’ve got a complete meal. My friend Steven made this for me about three years ago and it changed my life. Steven is one of the best chefs & bakers I know, and I wish he’d put together a food blog of his own so we could all cook a little better. This is his recipe verbatim, so thank you Steven!! 1. Trim, wash, and drain beans. 2. In large pot, heat olive oil on medium high. When hot, brown meat deeply on all sides. 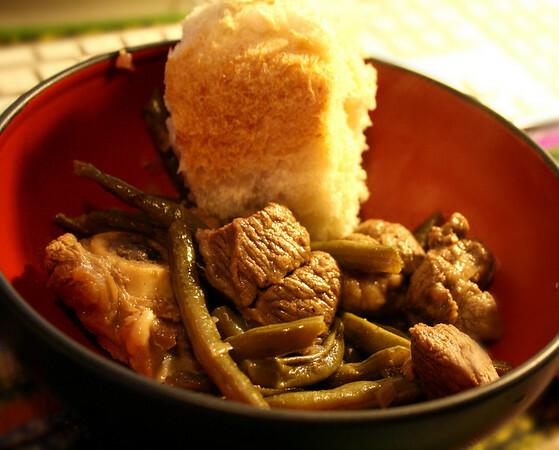 ( several pieces at a time so as not to crowd the pot… ) Then transfer meat to a plate. 3. After all meat is browned and on the plate… cook the onion in the pot until its a pale gold color. Return lamb to pot. Add salt, pepper, and the vinegar. Bring the vinegar to a brisk simmer for about 30 seconds, turning the meat and scraping loose browning residues from the bottom and sides of the pot. 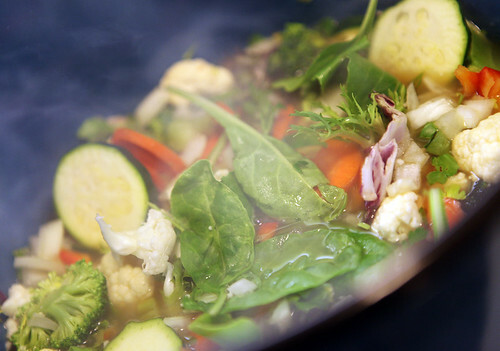 turn the heat down to cook at a slow simmer. Add the green beans and cover the pot. Lid slightly ajar. 4. Cook for about 1 1/2 hours until the meat is very tender. Saw this in a magazine a few years ago and tried it. Turned out to be really scrumptious. Sorry for the kind of gross-looking photo– took this picture before starting the food blog. 1. 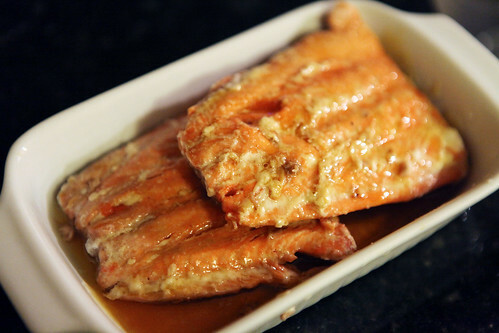 Combine the first four ingredients (apricot, mustard, garlic & soy sauce). 2. Combine the salt, cinnamon and pepper and sprinkle over lamb on both sides. 3. Heat a large skillet and then spray with Pam or cooking spray. 5. Add the apricot, lowering the heat to the lowest setting. Let it cook for another minute. I served this with carrots cooked in olive oil and some fresh bread fried in the skillet with a tiny bit of olive oil and garlic. 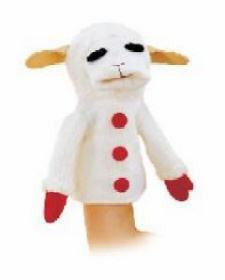 Now I’m in the mood for a little Lamb Chop’s Playalong! Did anyone else grow up with this show? Love it. 1. Pulse the first ten ingredients (through salt) in a blender or food processor until mostly smooth, but still chunky. Dump it into a large bowl and stir in the flour, onion, parsley, and baking powder. 2. Pour enough olive oil into large skillet to have 1/4 inch in bottom and heat. I always test the readiness with a couple breadcrumbs or a few drops of water. If the oil crackles and scalds you, it’s ready. 3. 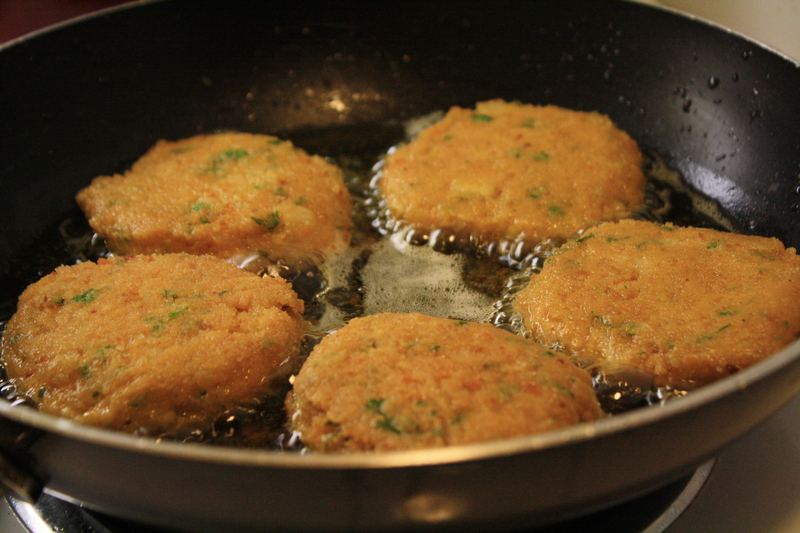 Shape 1/4 cup chickpea mixture into a patty like the one in the photo, and then lightly pat breadcrumbs on it and drop it carefully into the pan and cook 3 minutes per side until golden brown. Transfer to paper-towel-lined platter to drain. Don’t let the falafel stick together! 4. To make Yogurt Sauce: Combine all ingredients in serving bowl. Season with salt and pepper. 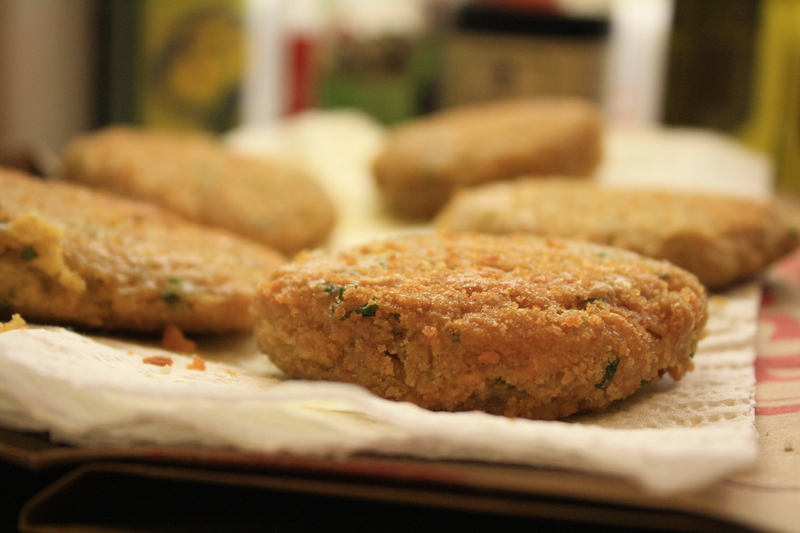 These turned out delicious and moist– one of my biggest complaints about falafel is that it tends to be super dry at some restaurants. 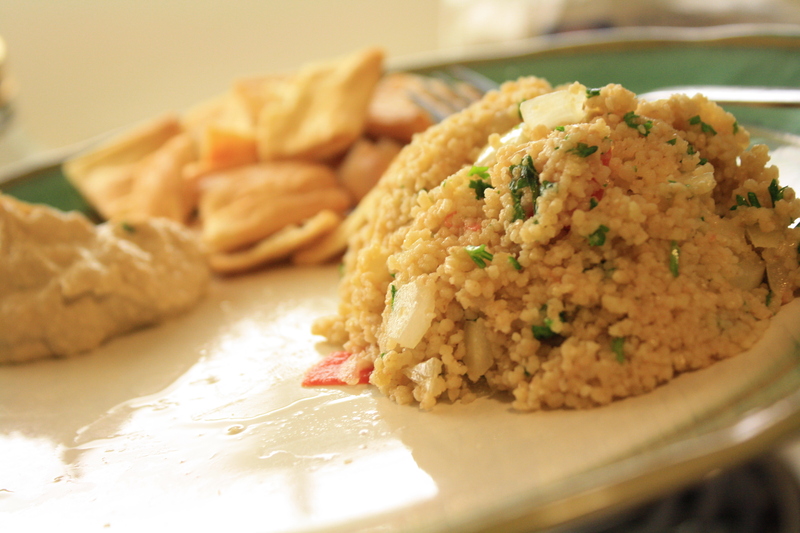 I also put together a couscous salad. To make the couscous you prepare as directed on the box with slightly less water and no butter, then add around 6 Tbsp of olive oil, 1/2 chopped onion, a tomato, parsley and seasoning. I pretty much stuck to the recipe on the back of the TJ’s couscous box. Not very creative, but yummy. The boyfriend made a gyro out of his and wedged the falafel in a warm pita with hummus. I’m getting kind of hungry thinking about it. WARNING: for those of you who don’t like chickpeas or have never used them, please note that chickpeas are the same thing as garbanzo beans. I traveled to three separate grocery stores like a moron searching for chickpeas with no luck. I like the name garbanzo better, and think it would also be a good name for a cat.